The coupon was in bold, capitalized print, on a little slip of paper, paper-clipped to the top of the inside of the menu. “Ha ha… hey, well we’re all Ukrainian Winnipeggers, ” my aunt chirped. I ordered the Eggs Benedict, as I always do. Like so many of my kind, I am a creature of habit. My aunt and uncle were in town visiting from Winnipeg, so we took them to our favourite breakfast place- “Break the Fast”. We had been going there for years and their Eggs Benedict was nothing short of amazing! Situated on the south side of the Penny Lane Mall (facing 9 Avenue) up on the 2nd floor (above the sign “mynt” in the photo below), it was a haven for breakfast and brunch goers in downtown Calgary’s sea of office towers and malls. With high ceilings, an open and airy feeling, lots of sunshine, a casual and relaxed, yet charming atmosphere with perogy breakfasts to boot, no wonder it was my favourite breakfast place! The owner herself, a Ukrainian Winnipegger, no less. I’ve yet to meet an Eggs Benedict I wouldn’t eat, even the bad ones are preferable to many other breakfast dishes. Well, that’s my humble opinion anyway. There was a time I forced myself to order something different; to break free and think outside my little food box. Yet every time I did, it completely missed the mark and I seriously regretted my decision. These days I do a lot more cooking at home so I like to make my own Eggs Benedict. But typical recipes are time-consuming. So I have created my own speedy version that is a unique, delicious and easy breakfast recipe! 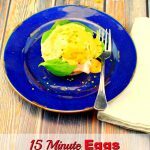 If you are looking for an easy breakfast idea for Mother’s day, look no further! With quick, microwave poached eggs, and a shortcut blender Hollandaise sauce, (this is the blender I use and I love it! 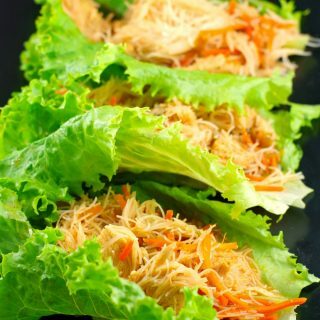 This recipe tastes gourmet (like you spent hours in the kitchen) but it’s made in 15 minutes! Make it vegetarian or with prosciutto – your choice. You can also make the poached eggs the old-fashioned way. And the sauce can be reheated. 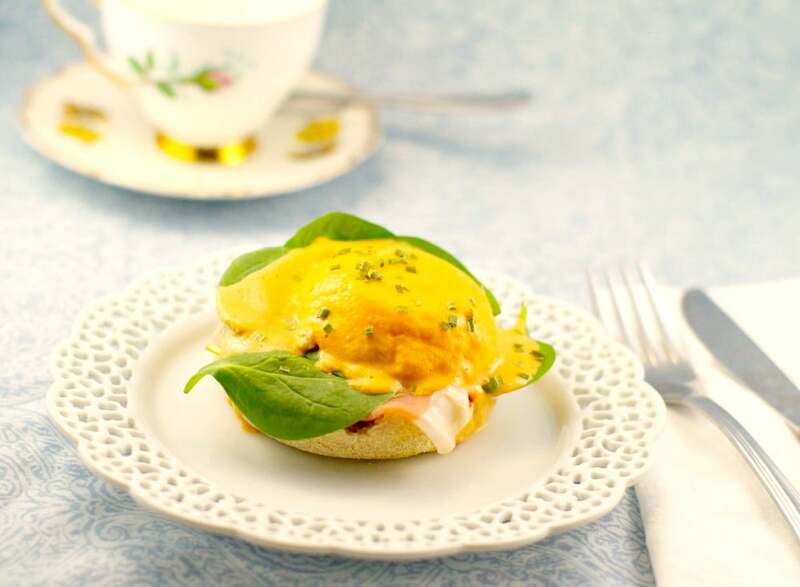 I love this eggs benedict variation because it can easily be served at a casual breakfast or an elegant brunch. Either way, it’s quick and a great Mother’s Day breakfast recipe! I don’t think Break the Fast expected to have an entire table of Ukrainian Winnipeggers actually take them up on their discount coupon offer, but hey, we’re Ukrainian and you know what they say about Ukrainians? So after a bit of an interrogation as to our heritage and hometown, we got our discount. Sadly, Break the Fast is long gone. It went down along with the Penny Lane mall when it was levelled over a decade ago to make way for more office towers. After all, office towers are king in Cowtown. But things change- it’s all part of progress, so I’m told. Still, it doesn’t matter where I go for breakfast these days, I always order the Eggs Benedict. The seeming necessity for schooling myself in new ways has ceased to exist. DO YOU ALWAYS ORDER THE SAME THING WHEN YOU GO OUT? I’d love to hear your comments! 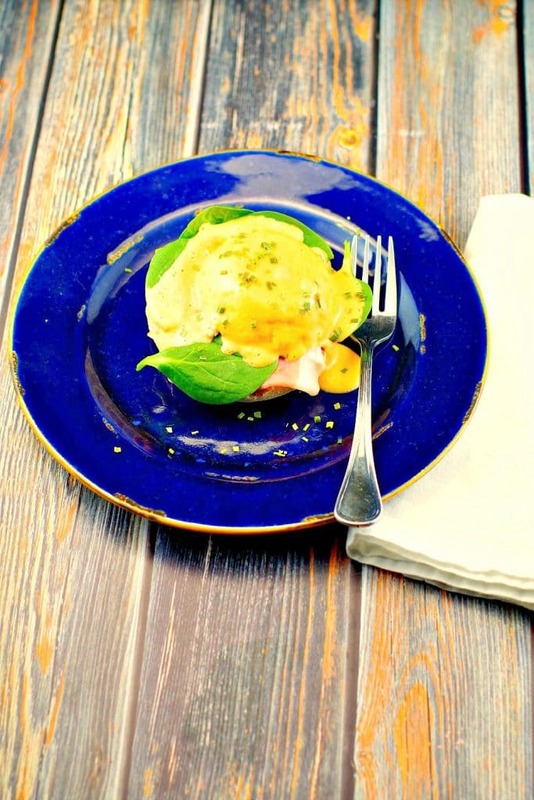 This Easy Eggs Benedict Recipe is simple enough for everyday, yet sophisticated enough for a holiday brunch. It's a speedy, unique variation on eggs benedict, with quick microwaved poached eggs and a short-cut Hollandaise sauce. It tastes gourmet (like you spent hours in the kitchen!) but it's made in 15 minutes! Make it vegetarian or with prosciutto - your choice. Add the artichokes roasted red pepper, tamed jalapenos, blend, then add apple sauce, egg yolks and lemon juice, maple syrup and parmesan cheese to blender and puree. Butter and Oil: In a small bowl, add the butter and melt on medium heat in the microwave. Add the oil to the butter, and heat again so the mix is warm. Then slowly add the olive oil butter mixture on low speed until you get a nice creamy sauce. Quick poached egg: Spray the inside of a coffee mug with non- stick cooking spray. Break egg into mug. Put egg into microwave for 30 – 40 seconds (with cover) or until egg is set. Gently loosen by running knife between inside of mug and egg. Add 1 piece of prosciutto, then spinach to one side of english muffin. Top with egg. Pour Hollandaise sauce over egg and garnish with parsley or freeze-dried chives. Serve and enjoy! Reheat Hollandaise sauce as necessary. Hi Terri, I am also an eggs benny lover. I try many different versions and yours here sounds so delicious. Hollandaise is already rich and luxurious, and the way you have elevated it with the roasted peppers, artichokes, apple sauce, jalapenos, has my taste buds dancing. Love the addition of the fresh spinach and prosciutto. I laughed as I got the visual of all those Ukrainians getting their coupon redemption. We are Italian and it’s the same always into the deal. 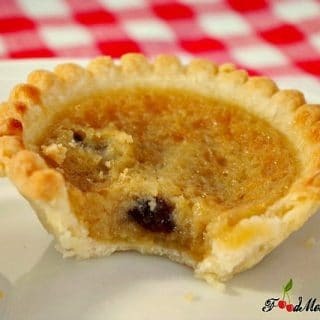 Great post and recipe. Terri – I didn’t ever go to this restaurant but we had our wedding reception in Penny Lane….I was sad to see it go down. I love eggs Benny too, but I rarely make it at home…it’s an indulgence when (if) I get out.